As the world's biggest sporting event progresses through the knock-out stages UK and Eire footy fans are being offered the chance to watch six unmissable games in 3D at cinemas in a number of towns and cities. Starting on 2 July, SuperVision Media will be showing three of the quarter finals, both semi finals and the final itself on 11 July. 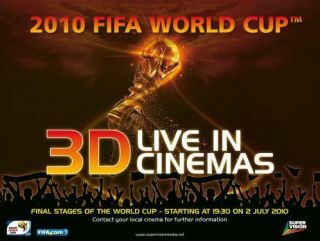 Screenings are expected to be priced at around the same cost as a 3D movie with 3D specs provided by the cinema. Cineworld has confirmed its prices as £15 for adults and £12.50 for children and concessions. SuperVision Media director daniel Webber says: "If you are not going to South Africa this will be the next best experience you can have." Possibly even better, we think, since it seems unlikely that vuvuzelas will be allowed in the cinemas. For more information on Cineworld's screenings see its website: www.cineworld.com.